Traditional musician? Looking for new and exciting opportunities around teaching others? Whether a performer interested in learning new skills as a tutor, or a practising tutor who would like to brush up on their knowledge and share best practice with others, this brand new training programme from trac will have something to offer most traditional musicians. 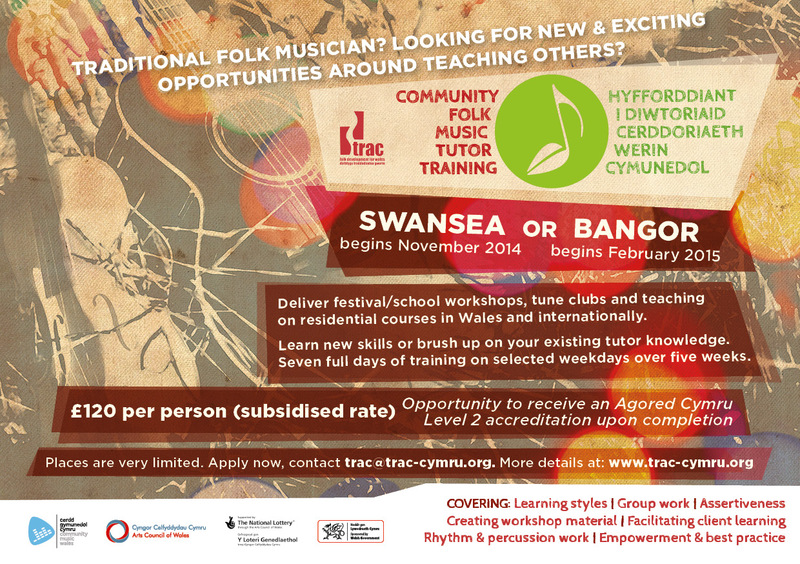 As a traditional music tutor there are many opportunities for work in Wales and internationally. Whether it be delivering a workshop at a festival, running school workshops, tune clubs or teaching on residential courses, the chance to add extra value to your portfolio is now. Participants will have the opportunity to receive an Agored Cymru Level 2 accreditation upon completion. Each course takes place across seven full days of training on selected weekdays over a five week period. Experiencing a workshop – empathising with participants, how does it feel to overcome a challenge, trying something new. Participants will design, plan and lead a short, on- to-one teaching session. Review: the teaching sessions will be reviewed through feedback and group discussion, providing learning for group teaching later in the course. how to vary activities to keep everyone engaged. Stephen will present an overview of the process of working bilingually, emphasising the importance of contexts and audiences. We will concentrate on two specific scenarios – leading a workshop, and public presentation – noting the differences between the two. The participants will have the opportunity to discuss their own experiences of bilingual teaching and presentation, as well as developing their own bilingual techniques for working bilingually. The session will end with a brief recap, and the opportunity for questions and feedback. Building your own skills, understanding the basic techniques on different instruments, warm ups, practical ideas and approaches, working with those who have difficulty playing in time. An introduction to a range of approaches to community music in current use. A chance to participate in games and exercises suitable for different groups and settings. A chance to devise original workshop activities and material. Action planning: How to use the skills and knowledge from this course in your work. Sarah is a founder member of the Natural Voice Practitioners’ Network www.naturalvoice.net, and leads workshops in South East and Mid Wales, including regular groups for Disability Arts Cymru, Gwent Arts in Health and Alzheimers’ Society. She has worked in UK, Australia and Spain teaching world, folk & traditional music. Sarah composes and performs regularly with quartet The Quiet Ranters, with Folk & Blues duet The Blameless Hussies and with The Unicorn Singers. 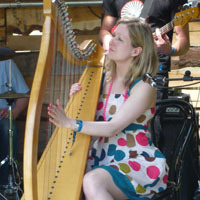 Sarah regularly runs sessions on community music tutor training for Community Music Wales. A native of Swansea, Peter won first class honours in music at Liverpool University and went on to complete a Ph D thesis at the University of East Anglia. Following his studies Peter returned to Wales where he worked extensively in community music, music theatre, and music therapy. He performed for many years with Welsh folk groups, Cromlech and Aberjaber. Peter is an active composer who has been commissioned by BBC Radio 3, the BBC National Orchestra of Wales, Artreach, the Sirenian Singers, India Dance Wales, Carmarthenshire Music Service, amongst others. David Pitt is an artist, maker and musician. He works as a storyteller and facilitator of creative activity workshops for children and adults that can include mask and puppet making, ephemeral sculpture, music and words. He has taken his workshops into schools, libraries, museums, community groups and training and has 18 years of experience in the field. A musician and bass player himself, he has toured internationally with poets and musicians and also worked as an Events Coordinator and Art Consultant for children’s projects. He has been part of the National Trust “Arts In Trust” environmental art and education projects and he also holds a CIEH Professional Trainers Certificate from Swansea Business College. Stephen Rees has been deeply involved in the traditional music of Wales for more than 30 years. Brought up in Ammanford, Carmarthenshire, he has made North Wales his home since 1988, lecturing in music at Bangor University. He joined the group Ar Log in 1982, and toured with them in the UK, Europe, and in North and South America; he also recorded five albums with them between 1982 and 1996. In 1999 he formed the group Crasdant who toured extensively in Wales and North America; Crasdant released three albums on the Sain label. Between 2006 and 2011, he was joint musical director of Y Glerorfa (the Welsh Folk Orchestra). He was a founder member both of Clera (1996) and trac (1997). An experienced tutor in traditional music, he has led many numerous workshops throughout Wales. Community Music Wales has a good success rate in training, with over 500 people going through their courses. trac has adapted CMW’s established format, with the aim of producing the next generation of community folk music tutors able to deliver high quality teaching.